Rev. Richard Smith, senior pastor of Germantown United Methodist Church in Germantown, Tenn., in the McKendree District of the Memphis Conference, offered some personal reflections last week (to staff and key leaders of his congregation) about the situation in Ferguson, Mo. Germantown is a city that borders Memphis, Tenn., on its east/southeast side. With Richard’s permission, I am sharing his reflections (below, slightly edited) as a way to help us all move forward from this tragedy. There is no way for any one of us to know for sure whether Darren Wilson was guilty of a crime when he shot Michael Brown to death on Aug. 9. Whether justice was truly served is beyond our comprehension, I believe; certainly beyond mine. Do I personally believe that Officer Darren Wilson bore some level of responsibility for the death of Brown? I do. It is hard, from the outside looking in, to see that the level of force he used was absolutely necessary. Would sitting in the conversations and the evidential reviews of the Grand Jury have led me – or you – to a different perspective? We’ll never know. Let me offer some personal reflections, which may or may not help in any way, but they are my heartfelt feelings about how we move forward from this tragedy and its aftermath – both in Ferguson, Mo., and in Memphis, Tenn. There is tragedy on several fronts here. The Brown family has lost their young son in a violent way and that pain will be real with them for months and years to come. Meanwhile, Darren Wilson will not be able to live a normal life for months and years to come; if ever. It is clear that the racial context in Ferguson – and here in Memphis – cannot be ignored. There were too many chilling accounts of police profiling and mistreating blacks in the Ferguson community for us to not pray for and encourage a change in that community. There are too many instances right here in Shelby County, Tenn., of African-Americans being mistreated for us not to pray for and actively seek greater justice, equality, and compassion as we live and work as brothers and sisters in our wider community. Listen to those who might radically and passionately disagree with us on issues like this. No one has all the answers and when we care like Jesus, another person’s opinion and experience matter to us. Avoid demonizing either Officer Darren Wilson or Michael Brown. Only God knows fully what happened that night of Aug. 9 and why. Passionately, fervently step up our efforts to make our communities more loving, equitable, affirming, racially- and culturally-inclusive places. We Jesus folks have a unique opportunity to show the world at large how we deal with heated, complex and controversial matters without any of us claiming absolute knowledge or wisdom. We can show the world what it means to treat each other with respect, consideration and Jesus-grounded love. Spend fervent prayer time praying for the Browns, the Wilsons, the civil authorities involved, the religious community of Ferguson, ourselves, our community at large. 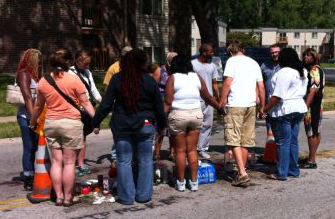 This is a time when considerable prayer is needed by all people of faith. Be clear that while protests are a natural and sometimes needed response to extreme civil disappointment, violence and hateful disruption are not acceptable. We need to work toward reconciliation which then leads to disciplined conversations about what needs to change for things to be different for those who are racially and economically mistreated in our society. Racism is alive and well in America and we cannot ignore that. I tried to post a comment A reply cam back Sorry this comment could not be posted. I would like to know what part of my comment did not meet the criterier .